Outstanding indie developer KlickTock have released their newest title, Doodle Find, for free! That’s right, FREE!!! Doodle Find is a hidden object game of a different sort. Unlike story or character-driven, hidden object games like Nick Chase or Where’s Waldo, Doodle Find is all about the pure thrill of the hunt. You just have a a bunch of random objects and a prompt at the top identifying your current target. The gameplay is almost identical to their other hidden object title, Super Search 60, and it’s every bit as fun, with just a few minor differences. Like Super Search 60, everything is laid out in a grid, but Doodle Find starts out a little easier, with big holes in the grid that gradually get filled in as time ticks away. 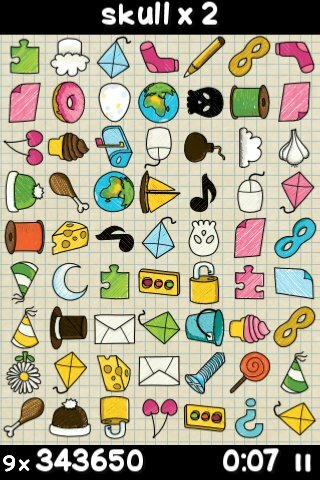 Doodle Find gives you 90 seconds to find as many objects as you can, which can be quite a lot if you’re any good, but you’ll be easily tempted to play again and again. It’s the art which really makes the game, and while I was a big fan of Super Search 60’s clean, iconic style, I actually prefer the slightly rougher, hand-drawn feeling of Doodle Find. The graphics and layout are still amazingly clean, but the unpolished “doodle” aesthetic gives the game a lot of color and also a ton of quirky charm. There isn’t any music, or options to play your own, but the visceral “pop” when you find an object is very crisp and satisfying. This is not a complicated game. The learning curve is practically nonexistent, and the difficulty is a little gentler than Super Search 60, but it’s still exceptionally addictive. Facebook Connect makes it easy to compare scores with your friends, but there aren’t any other online options. I would have liked a personal scoreboard to keep offline track of my highscores, but it’s a minor quibble for such a fun game. Having played both Super Search 60 and Doodle Find many times, I can say that Doodle Find is an across the board improvement on an already fabulous game. I have no doubt that this is going to be a massively popular game, so keep an eye out. Doodle Find is one of the best hidden object games I’ve played on the iPhone, which makes it doubly impressive that it is going to be 100% free. Believe me when I say that there’s really no downside here, just a seriously fantastic free app from a top-notch indie developer. AppSafari review of Doodle Find was written by Tracy Yonemoto on May 11th, 2010 and categorized under App Store, Board, Free, Fun, Games, Puzzler. Page viewed 6342 times, 1 so far today. Need help on using these apps? Please read the Help Page.